The current Russian administrative territorial division was formed in 1993, with the passing of the country's constitution. It was further modified as several federation subjects got merged in the second half of the 2000s (out of the original 10 autonomous districts, six ceased to exist in the process). 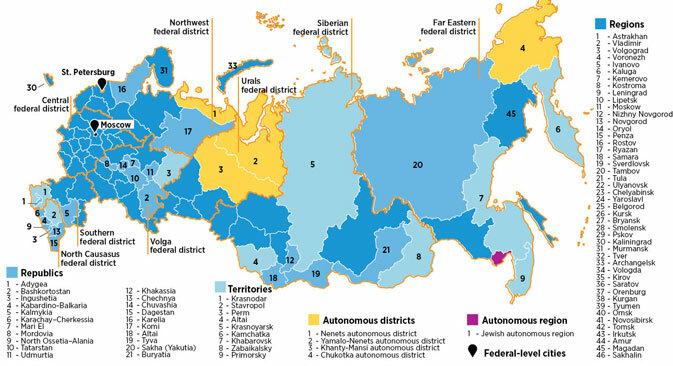 There are 21 ethnic republics in Russia, alongside nine territories, 46 regions, two federal-level cities (Moscow and St. Petersburg), one autonomous region (the Jewish Autonomous Region), and four autonomous districts.